Yep....You've guessed it, I've had time to create with this weeks Color Challenge on SCS. This weeks colors are Kraft, Riding Hood Red, Summer Sun (Black is optional). I don't use a lot of Kraft in my creations, as a matter of fact, I only had 1-1/2 sheets of Kraft card stock left in my drawer. My go to color instead of Kraft is Chocolate Chip. Anyhow on with my card. I randomly stamped the flowers from Fifth Avenue Floral in Black on the Kraft and Summer Sun panels. Added some distressing to my card stock. 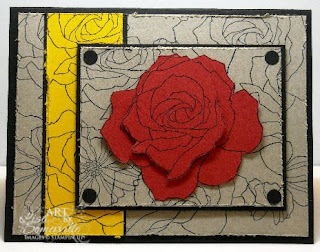 Stamped the Rose in Black on Riding Hood Red twice, cut out part of the image from the second flower and popped it up with dimensionals over the first one. The Faux Brads were made with the 1/4" Circle Punch. This is beautiful! I love how you popped up part of the flower. Wow! this is beautiful!! love the dimension of the flower. I like kraft when I use it....but don't use it a lot. Your art simply astounds me. I don't visit every day but when I do I get caught up on your posts (you in are my google reader) and of course everything is beautiful. I really really love When One Door Closes. Gorgeous. Lisa, this is wow, wow, wowwwww! Very lovely! Oh wow, I love this. It is so clean and crisp!!! Love how you layered the centre flower too.